Wittenborg CEO, Maggie Feng, recently met with four students from the Entrepreneurship Academy in Romania who were on a visit to the Netherlands as part of an exchange trip with Team Academy. The Academy, an international school for entrepreneurship in Amsterdam, recommended they visit Wittenborg. The group met with Feng at Wittenborg Amsterdam where she fielded questions about Wittenborg and what it stands for. 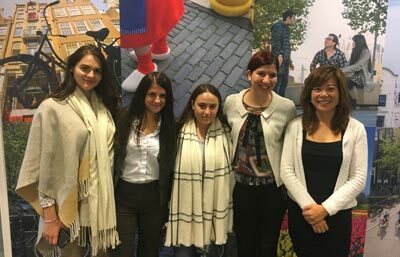 One of the group members and first-year student, Smaranda Vlad, said one of their tasks during the exchange was to visit businesses in the Netherlands which are operating in their area of interest. "Four of us are very interested in education and the differences between the traditional ways of teaching and all other systems. We have all either participated in different educational projects in Romania and worldwide, or have been educated in private schools."